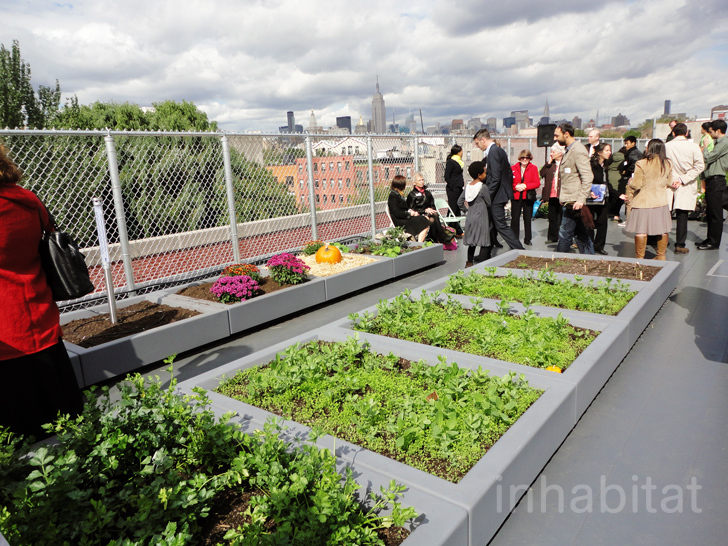 The Fifth Street Farm recently unveiled its 3rd rooftop farm classroom atop the Earth School on Avenue B, and we were on hand for the momentous event. Designed by architect and Earth School parent Michael Arad, the gorgeous rooftop farm will have students growing everything from kale to basil and teach them about sustainable agriculture. After the ribbon-cutting ceremony, we took a tour of the new urban farm with the students. Flip through our photos for all of the delicious deets. Manhattan Borough President Scott Stringer joined Arad and a myriad of local officials to cut the green ribbon and plant a ceremonial first seedling on the gorgeous new rooftop farm. Four years in the making, the roof farm was once thought of as a radical notion, but now joins other green programs in the Earth School. Students were excited to explain their cafeteria compost system, which transforms school lunch scraps into fertilizer for the new farm, and show how they reduced the garbage bins in the cafeteria from 50 to just two. For the ceremony, they prepared samples for guests to enjoy, cooking up warm kale with red onion and a tasty kale salad. The pint-sized advocates also gave a presentation on solar panels, hoping to entice city officials to get behind the project. At the conclusion of the ceremony, Michael Arad pointed out that through initiatives like the Fifth Street Farm, kids are are able to reconnect with nature and learn how things grow. By adding an outdoor classroom, these children will gain knowledge of the importance of fresh grown food as part of a healthy life, and will hopefully spread this information to the community. Check out more images on our Flickr stream! Manhattan Borough President Scott Stringer joined Arad and a myriad of local officials to cut the green ribbon and plant a ceremonial first plant for the gorgeous new rooftop farm. Four years in the making, the roof farm was once thought of as a radical notion, and now joins other green programs in the Earth School. Students were excited to explain their cafeteria compost system, which transforms school lunch scraps into fertilizer for the students’ new farm, as well as reduced the garbage bins in the cafeteria from 50 to just two. For the ceremony, they prepared samples for guests to enjoy, cooking up warm kale with red onion, and a tasty kale salad. Some little advocates also gave a presentation on solar panels, hoping to entice city officials to get behind the project. Through projects like the Fifth Street Farm, kids are reconnected with nature- a point that Michael Arad made on the importance of getting city gets to get their hands dirty and see how things grow. By adding an outdoor classroom, these kids will grow to be community influencers, and grow to know the presence of fresh grown food as part of a healthy life. Programs like Fifth Street Farm are helping to shape a future generation of earth-conscious New Yorkers.